Although the curved-top stool is undoubtedly the oldest form of throne--so much so that the Asante speak of "enstooling" a new monarch--Western-style chairs have been used as thrones for the Asantehene, provincial rulers, and the Golden Stool itself. They take several carpentered forms. The straight-legged , leather seated chair (hwedom) may be based on early Portuguese gifts of brass-studded leather and wooden chairs. This variety, known as akankromfi, a name that means "grasshopper," probably because of the insects folding legs. Although this throne type's legs do not actually fold, it is based on a Western collapsible chair of a type that dates to the 17th century and has been adapted. its oversize tacks are brass, and both attach the skin seat to the wood and act as decorative elements. Its openwork back stresses curvilinear forms, as do its arms; some seatback examples are more clearly derived from coats-of-arms. 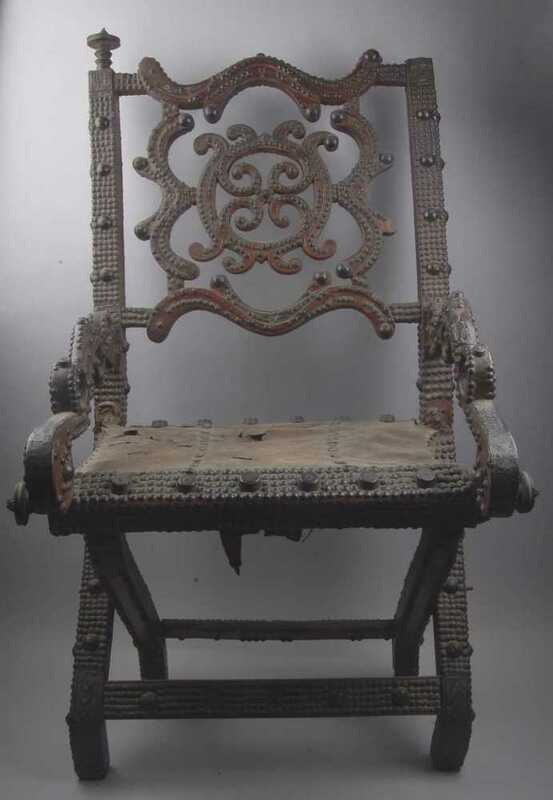 Although this akankromfi is recorded as having been part of Asantehene Prempeh I's palace furniture, it was not the only such throne there. The Royal Signals Museum in Dorset, UK owns a nearly-identical piece, although both of its finial knobs are intact.